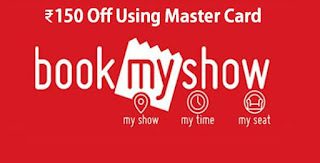 BookMyShow MasterCard Offers now back with a new offer from mastercard. you will get Flat Rs.150 Discount on no minimum ticket booking value. Get 50% off up to INR 500 on events, sports and plays and Get Rs.150 off using MasterCard on movie tickets. So what are you waiting for? Get a Free Movie Ticket Now. 1. First of all Visit BookMyShow Desktop Site From Here. 2. Login or Sign up on BookMyShow using your login credentials. 3. Click on your profile and then select QuikPay option and add debit/credit cardOption. 4. Register your MasterCard Details there. NOTE:- If you don’t have mastercard then use SBI Buddy App. Just enter your PAN Details there and you can create your virtual master card there. 5. select the movie, cinema and show of your choice. 6. Proceed to payment Option. 7. To avail offer, check ‘Avail Offers & Discounts’ and Under the QuikPay tab choose the MasterCard Offer. 8. Choose your MasterCard which you have added in Profile Tab and you can avail the offer & click on Apply offer. 9. Complete your transaction using your card and you will get the Rs.150 Flat discount on your bookings. 10. Enjoy your Free Movie using this BookMyShow MasterCard Offer. 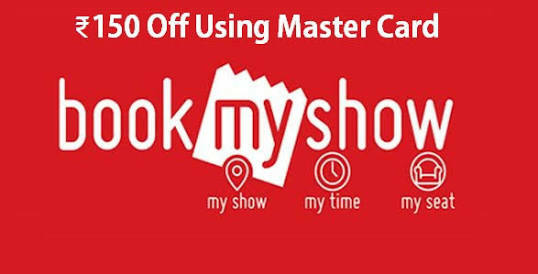 Offer is valid only on 1st transaction on BookMyShow.